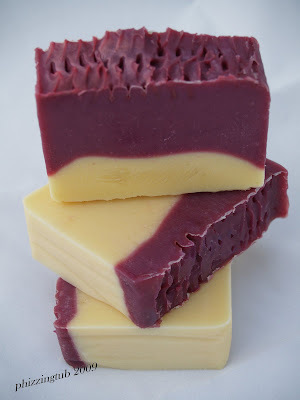 I think this is my favorite bar of soap I have ever made. Late last week I decided that I wanted to try to create a new bar with what I had on hand (with some input from a fellow soaper) and what we created is fabulous. This lovely bar was made with Hemp Oil, Cocoa Butter, and silk. The lather is perfect creamy (but not too creamy), has wonderful bubbles and it leaves your skin soft. The fragrance oil used in this batch was a B&BW type of Midnight Pomegranate (so lovely) and I'm totally thrilled with how it turned out. Looks beautiful. BTW I have used homemade ranch dressing on ceral before. Not a breakfast combo. er, uh, yeah, I think I would pass on that one.